South Korea's delegation poses before they leave for Pyongyang from a military airport in Seongnam, south of Seoul, (March 5, 2018). In a statement, South Korea’s government announced that North Korea was willing to discuss denuclearization with the United States, and to put off any additional nuclear or missile testing while talks are underway. The breakthrough marked the latest turn in an inter-Korea thaw that began in early January, when North Korean leader Kim Jong-un indicated his openness to such outreach in his New Year’s address. South Korea’s President Moon Jae-in moved quickly to lock in the goodwill offered in Kim’s speech, and the two sides arranged for North Korea to take part in the Winter Olympics in PyeongChang, South Korea by (among other things) marching with South Korea in the Opening Ceremony under a single flag representing a unified Korea and fielding a joint women’s ice hockey team. Pyongyang also sent high-profile envoys to both the Opening Ceremony (Kim Jong-un’s sister, Kim Yo-jong) and Closing Ceremony (Kim Yong-chol, head of the United Front Department of North Korea’s ruling party). 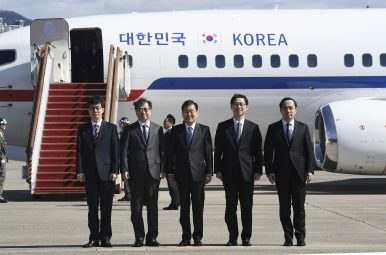 In the latest development, Moon reciprocated by sending his own envoys to the North.The 10-member delegation was headed by Chung Eui-yong, the chief of the National Security Office, and included Suh Hoon, the head of South Korea’s National Intelligence Service, as well as Vice Unification Minister Chun Hae-sung. On March 5, Kim Jong-un hosted the South Korean officials for dinner and a meeting at the headquarters of the Workers’ Party. The dinner, also attended by Kim’s wife, Ri Sol-ju, and sister Kim Yo-jong, reportedly lasted four hours. That was followed by additional meetings on Tuesday before the two-day trip came to an end. On Tuesday, South Korea’s Blue House released an announcement claiming a series of agreements had been reached with North Korea (38 North has provided both the original text and an English translation in a helpful graphic). First, the two sides plan to hold an inter-Korea summit at Panmunjeom in the Demilitarized Zone (DMZ). According to Chung, the talks will take place at the end of April in South Korea’s Peace House, which would make Kim the first North Korean leader to set foot on South Korea’s side of the de facto border since the Korean War. It will be the third such summit between top South and North Korean leaders. The two sides will also establish a hotline to help ease military tensions as well as enabling more general “close consultations.” North Korea also invited Seoul to continue cultural exchanges by sending a taekwondo team and artists to the North. The part of the announcement that garnered the most attention, however, had to do with North Korea’s nuclear and missile programs. In Chung’s words, the North “clearly affirmed its commitment to the denuclearization of the Korean Peninsula and said it would have no reason to possess nuclear weapons should the safety of its regime be guaranteed and military threats against North Korea removed.” In fact, Chung said that Kim indicated “that achieving denuclearization is his father’s dying wish.” Kim Jong-un’s father, Kim Jong-il, had ruled North Korea from 1994 to his death in 2011. It’s unclear, however, what steps will satisfy Pyongyang that the regime’s safety is “guaranteed”; if that requires a formal end to the U.S.-South Korea alliance it will be a tough sell in both Washington and Seoul. North Korea also signaled that it is willing to engage in negotiations with the United States over both denuclearization and the normalization of bilateral relations. A willingness to discuss denuclearization has long been a precondition of the United States for any future talks. Just this week, North Korea’s Korean Central News Agency (KCNA) had rejected the idea of preconditions as raised by the Trump administration. In another unexpected move, Kim did not make the cancellation of the upcoming U.S.-South Korea military exercises a condition for either continued talks or the suspensions of North Korea’s nuclear and missile tests. The annual exercises, which were postponed during the Olympics, are set to take place in April. In early March, just ahead of the South Korea delegation’s trip to the North, KCNA had vowed that North Korea “will counter the US” if the joint drills were carried out. Now that the North has conveyed a willingness to hold talks under unexpectedly favorable conditions for the United States and South Korea, the Trump administration will have to decide how to respond. If the White House does greenlight talks, they will have to move forward without the United States’ special representative for North Korea policy, Joseph Yun, who retired last week. A spokesperson for the Blue House indicated that the Chung and Suh would soon be travelling to the United States to discuss the outcome of their talks in Pyongyang. Chung will then visit China and Russia while Suh will head to Japan, thus looping in all members of the erstwhile Six Party Talks on North Korea’s nuclear program.